The Vanderbilt Cup Races were held on Long Island from 1904 to 1910, drawing crowds of over 250,000 spectators. 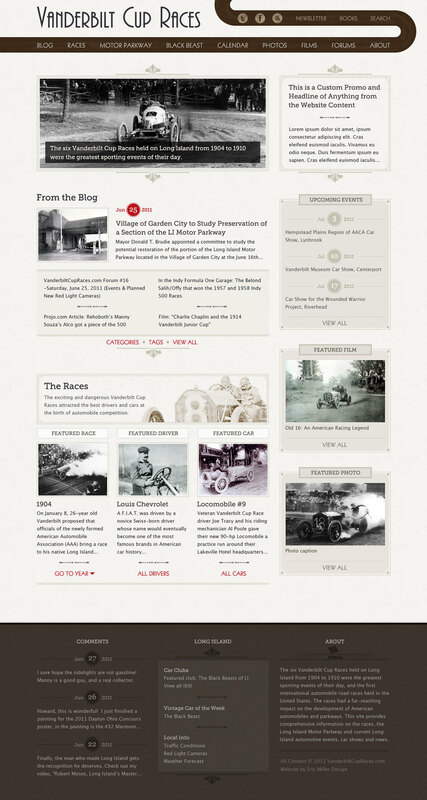 The website serves as an online museum covering these historical races, as well as a home for current news and events surrounding car racing. We completed a redesign of the website, and expanded on the existing ExpressionEngine system to highlight profiles of the races, drivers and cars and extensive photo and video archives. Our work included content strategy and developing a new site architecture. A new landing page for the main content of the museum highlights races by year, drivers and cars. Detailed profiles of races, drivers and cars were created, with relationships to show who drove what cars in what years, and related articles from the blog.